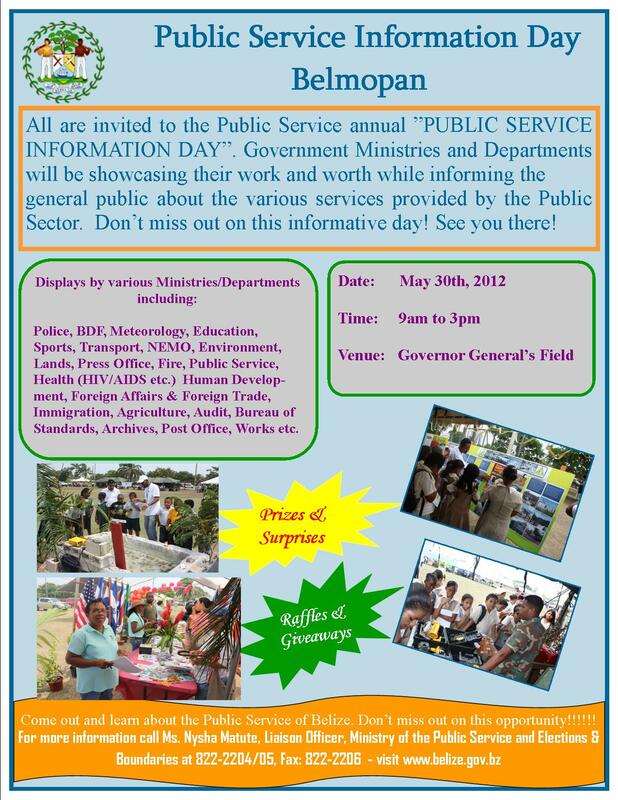 All are invited to the Public Service annual “Public Service Information Day”, to be held on May 30, 2012, from 9:00a.m.- 3:00p.m., at the Governor General’s Field. Come and see Government Ministries and their departments, including the Police, BDF, Meteorology, Education, Environment, Human Development amongst others, as they showcase their work and provide you with worthwhile information on the services that are offered. There will be prizes, and surprises, along with raffles and lots of giveaways. Come on out and learn about the Public Service of Belize. Don’t miss out on this opportunity. For additional information visit: http://www.belize.gov.bz.